Plum Bistro, Seattle's wildly popular vegan restaurant, is known for its delicious and innovative vegan recipes using local ingredients. Sure to please both vegans and meat-eaters, this cookbook features Plum's flavorful, comforting dishes for brunch, soups, salads, entrées, desserts, and more. This photo-filled book features 60 recipes, including Pesto Plum Pizza, Good Old-Fashioned French Toast, Barbecue Oyster-Mushroom Sliders, Fresh Blueberry Shortcake, homemade vegan pasta, and more. 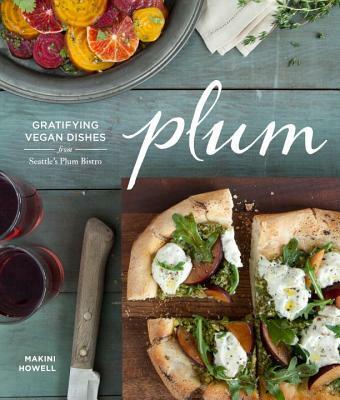 Bring home delicious vegan cuisine with the Plum cookbook! Makini Howell has been passionate about creating a chic dining experience that appeals to vegans, foodies, and omnivores alike since her days of living in New York City working as a men's denim designer. In 2005 she moved back home to Seattle with the goals of redirecting her family's restaurant business and creating a new perception of veganism. Makini is focused on using organic and non-GMO seasonal produce and herbs from family-owned farms in combinations that are both comforting and unexpected. As an entrepreneur she has developed a sustainable business model using what the earth provides to supply wholesome, nourishing food. "We so appreciate the wonderfully creative recipes in this very beautiful cookbook! The importance of delicious vegan food helps pave the way for those who desire to make the transition from the standard animal-based diet." "Makini Howell’s cookbook will prove to anyone just how delicious vegan cuisine can be. Her food is flavorful, fresh, and mouthwatering. A must-have for anyone who loves to eat. This is a cookbook I will buying for my friends and family." "The food at Plum Bistro is comfort food, fresh food, tasty and innovative food: a testament to the talented and driven owner and head chef, Makini Howell. It’s one of my favorite vegan restaurants in the world." "What Makini does at Plum and as a personal chef is creative, innovative, and satisfying. . . . Instead of seeing ‘vegan’ as a restriction, she has her own style. I never feel like I am missing anything." "Makini Howell’s food defies convention. Yes, it’s vegan, but many dishes are so rich and succulent, guests at her table sometimes wonder if she slipped up and mixed in a drop of cream or a dollop of butter. . . . Reflecting the matter-of-fact, easy generosity of Makini herself, this book is chock-full of recipes that make creating a vegan table a piece of (egg-free) cake." "I dare you to open this cookbook from Seattle's Plum Bistro to any page and not think the recipe you find there is completely irresistible. Tiramisu pancakes? Check. Cauliflower bisque with fresh fennel? Yes, please. Black plum and ginger sorbet? Oh, you know it. Chef Makini Howell's recipes are vibrant, wholesome, and absolutely popping with all the fresh flavors of the season. ...Oh, and did I mention they're all vegan?" I’m not vegan but I love Plum: Gratifying Vegan Dishes from Seattle’s Plum Bistro... This book is filled with vibrant vegetable dishes and interesting takes on traditional dishes, such as basil soy ricotta. I can’t wait for summer so I can have grilled plum and jicama salad with radicchio. There’s a great technique for making egg replacer in this book that might be worth the price alone. And, much of the book is naturally gluten-free." "From Seattle food icon Makini Howell comes this much-anticipated cookbook, a luscious volume of recipes from the author’s family-owned restaurant, Plum Bistro. Howell’s cooking is all about simple, fresh, and local, and this photo-filled book...showcases such delights as Pesto Plum Pizza, Barbecue Oyster-Mushroom Sliders, and Fresh Blueberry Shortcake. Let the mouthwatering commence." "Celebrated chef, restaurateur and the author of the cookbook Plum: Gratifying Vegan Dishes from Seattle's Plum Bistro, Makini Howell imbues everything she touches with good taste." "[Makini Howell's] vision for Plum was to have a place where vegans and omnivores could come together in one community and leave feeling completely satisfied. Out of this restaurant came the cookbook Plum, full of inventive vegan dishes that are bursting flavor and fun to make. The range of recipes in Plum allow you to put together a variety of elegant meals for yourself, your family or even a night of entertaining. Peppered with beautiful color pictures and easy to follow instructions Plum is a great cookbook for novice cooks yet is creative enough to satisfy a more seasoned kitchen warrior." "...no matter your level of comfort in the kitchen there is something for you to make in Plum. This range of recipes is great for new and seasoned vegans alike, a rookie vegan could easily grow with this book, graduating from referencing staples and making mac-n-cheese to crafting seitan roasts and tempeh filets. I wish we'd had this book when we first stocked our vegan pantry!" "The book is beautiful to look at. Understated yet swathed in texture and light, photographer Charity Burggraaf brings Howell’s dishes within close reach. The pages are filled with Howell’s honest straightforward recipes that are as cutting edge as they are personal. I imagine a seat at Plum Bistro reflects the same sentiment. Bold flavors, traditional techniques, and fresh ingredients for everyone who loves to eat and cook, vegan or otherwise." "...a good collection of recipes for the enthusiastic home cook to make and enjoy." "You don't have to be a vegan to love these healthy creations from the famous Plum Bistro." "This colorful vegan cookbook from Seattle-based Plum Bistro captures the spirit and passion of chef, owner, and life-long vegan Makini Hawell with her recipes for vegan spins on pantry essentials, breakfast favorites, small plates, mains utilizing tofu, tempeh, and seitan, and desserts. Many of the recipes are also gluten-free and soy-free, but the book's luscious photos are sure to whet anyone's appetite, dietary restrictions or no." "The vegan chef makes it look easy, with chapters on replacements for conventional staples (egg foam, anyone? ), a helpful dissection of meat substitutes, and even a few mostly raw dishes for those in transition. Highlights: tostadas with spicy strawberry avocado relish, and balsamic tofu with white bean sauce and agave pumpkins. Most recipes are soy and/or gluten free and definitely aren’t all broccoli and turnips; expect recipes for sinful—yet morally sound—treats like tiramisu pancakes and tempeh vermouth." "...vegans and omnivores alike delight in vibrant photos and 60 innovative recipes that instruct readers how to concoct their own healthful meals at home using fresh and local food." "These recipes are for dishes full of flavour, texture and colour. Oh, and they’re vegan." "At first glance, this cookbook is gorgeous. Beautiful, colorful pages filled with delicious and fresh looking food. It is broken up into sections ranging from fundamentals, beginnings, small plates, salad & soups, transitional raw, tofu, tempeh & seitan, pasta, grains and dessert; there is nothing lacking in this book. Even a dog treat recipe in the back (which pretty much won me over). ...this has to be one of my favorite cookbooks of the year. It is one beginning and seasoned cooks will enjoy; I know I will be planning meals out of Plum for years to come."